The village of Kassiopi sits between the foothills of Mount PantoKrator and its rugged headland, with its hickldy-pickldy red-roofed houses, its olive groves and woodland. There are two main streets, one up to the central square of Kassiopi, named Heroes of the Politechnic Square and one that runs the length of the village down to the pretty harbour. Boats bob gently all along the circular harbour and every now and again a heap of bright yellow fishing nets remind us that this is not just a holiday resort. Kassiopi was traditionally a fishing village and there are a number of local residents who still proudly follow the steps of their predecessors. Overlooking the harbour is Kassiopi Castle, Its origins have not been categorically identified as building continued into the Byzantine period but it is believed to have been visited by Cleopatra of Egypt on her way to Rome in 46 BC and by the Emperor Nero who also paid his respects to the Temple of Zeus where the present day Greek Orthodox church stands. Indeed one of the main streets in Kassiopi is known as Nero's Baths. There are a number of bars and traditional tavernas on the harbour. By day the bars are full of calm, a wonderful location for breakfast or a leisurely morning coffee; by night a transformation takes palce and the harbour throbs with music, dancing - everyone happy to let the lively mood of the Kassiopi evening take over. Kassiopi Castle is located aroud the headland overlooking Kassiopi's picturesque harbour. The entrance to the Kassiopi's castle is via a pathway opposite the church on the way down to the harbour. The undemanding walk up to the headland offers a wonderful opportunity to wander round the isnide walls of the fortress. Stunning views of Kassiopi and across the Ionian Sea towards Albania. Scuba Diving - There is a dive school in Kassiopi giving you the chance to explore Kassiopi unerwater with your very own personal instructor. Both beginners and novices can enjoy this thrilling experience with the assistance of fully qualified diving instructors. Speed Boat Rental - Hiring a boat for the day is a great day out and offers the chance to visit secluded beaches and stunning bays around the east coast of Corfu. Excursions - Daily cruises to Corfu town and other areas of interest on Corfu are available every day. A chance to visit Corfu's capital while admiring the coastline and avoiding the windy roads! Beaches - There are three main beaches in Kassiopi, two around the headland from the harbour and the other, at the top of the road leading out of Kassiopi. If you follow the road to the left of the harbour, you will find yourself on a pathway climbing upwards. At the peak of the hill there is a beautiful view of the hills surrounding Kassiopi. The pathway will take you past the castle ruins. A short walk downwards and you will find yourself overlooking two small bays will layers of smooth flat rocks perfect for sunbathing. The church - The church in Kassiopi has been dedicated to Our Lady, it is built on the ruins of the temple to Kassios Zeus whcih was a vcery important temple in its time. The port of Kassiop was considered a safe harbour as the natural passage between Greece and Italy and ships passing would salute the temple with fireworks. Inside the church there are many Byzentine icons and a Byzentine mural. You are welome to go inside. Paxos & Parga - According to mythology the idyllic island of Paxos, just to the south of Corfu, was created by Poseidon where he entertained his lovers. The rugged landscape the little protects pastel coloured houses that make up the sleepy villages as they nestle in the olive groves. It is also very popular with the Greeks who visit for the food, the picuresque scenery and the tranquil atmosphere. You’re almost guaranteed great weather in Corfu in the summer. Temperatures are usually around the 30s, plus you can also expect around 12 hours of sunshine a day. And as for the rain, you’ll hardly see a drop in July and August. However, if you prefer to be a bit cooler, the spring and autumn months see plenty of sun, but temperatures are a little more comfortable - in the mid-20s. The shoulder months are a fantastic time to visit Corfu if you’re into your walking, sightseeing and photography as it’s not too hot, even in the peak of the day. You might experience some cooling rain showers from time to time as well. May is a beautiful month on Corfu and traditional May Day celebrations include pic-nics in the coutry-side and collecting wild flowers to make May Day Garlands. In Kassiopi there are far too many restaurants to mention and vistors are really spoiled for choice. The cuisine of Kassiopi's restaurants and tavernas includes traditional Greek, Italian, English, European. Kassiopi also has a choice of gyros shops with tables and a charcoal grill for real carnivores. Sea food is a top favourite among Kassiopi's visitors with plenty of fresh fish on the menu too. Bus: The green KTEL buses offer a frequent service from Kassiopi Sqaure to Sidari, in one direction, and Corfu Town in the other. Taxi: There is a taxi rank in Kassiopi by the Heroes of the Polytechnic Square. Check tarrifs with the driver first. Car Hire: This is an ideal way to get around independently. Prices are reasonalble and a comprehensive cover available for peace of mind. Hydropilis Water Park in Acharavi 12 kilometers away. There are excursions to Hydropolis. Equally, it is easy to get to by car as the water park is on the main road from Kassiopi heading westwards. Greek is spoken on Corfu. Pou eene i paralia? – where is the beach? Pou eene o fournos? – where is the bakery? Ti kanis? – how are you? All basic amenities are available in Kassiopi including well-stocked supermarkets, a pharmacy and two bakeries. Other types of shops are clothes shops, souvenir shops, lace shops. 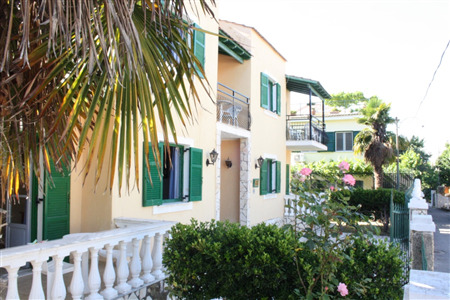 This newly built villa Cassius Hilla House is located in the village of Kassiopi on the north east coast of Corfu. 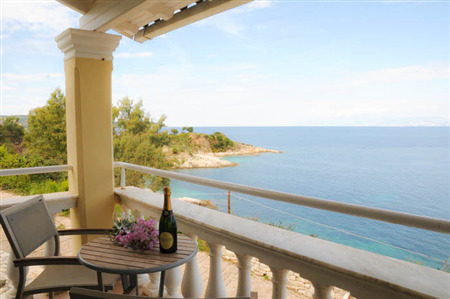 Situated on elevated land the villa has stunning views over Imerolia beach, the coastline and the lush green mountains. 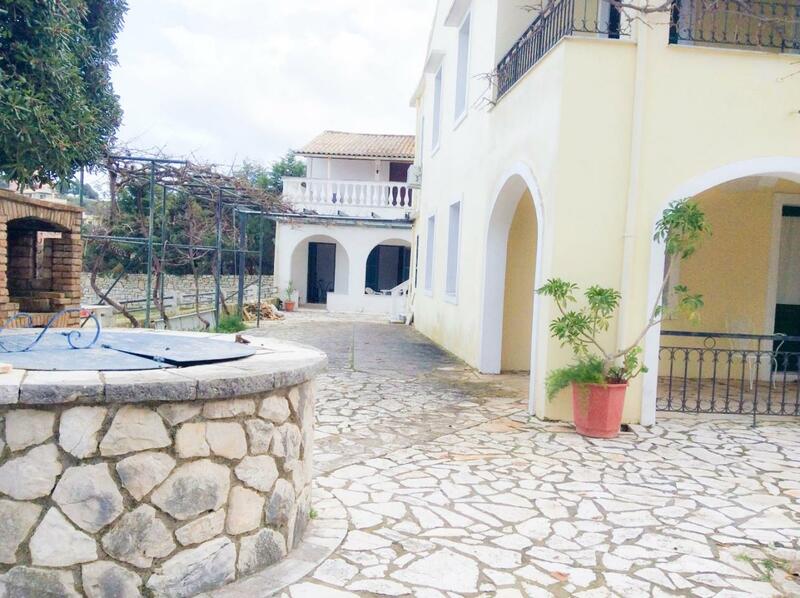 This three bedroomed..
Olive Grove Beachfront is located in the town of Kavos, 50 m from the beach. Featuring a beach bar and swimming pool. 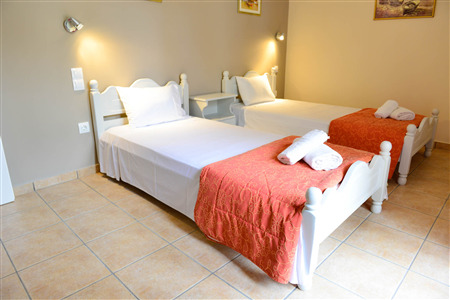 It has 16 accommodation units with kitchenette, private bathroom, WiFi and balcony. Guest may also visit the shopping facilities, bar.. 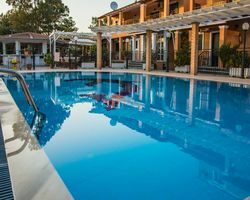 The Andreas Pool Complex is located in the heart of Kassiopi on the north east coast of Corfu and it is the perfect spot to enjoy plenty of well-earned relaxation. It provides a very appealing air of peace and seclusion. 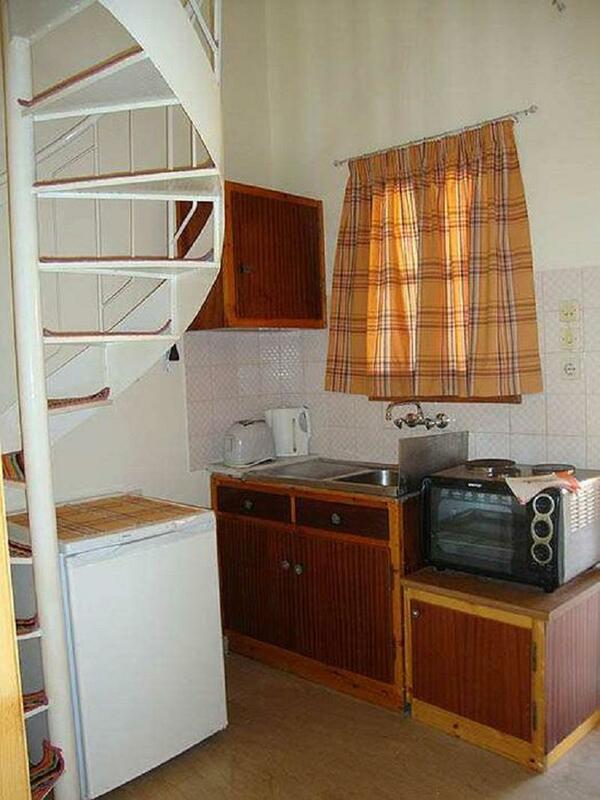 All apartments have a kitchen..
Antigoni's apartments are situated in an ideal location, with excellent views of Kassiopi Harbour and a small beach only meters away! These apartments provide excellent value for money for those looking for a simple yet clean and spacious base for.. Spacious Studio a short walk from Kassiopi centre. 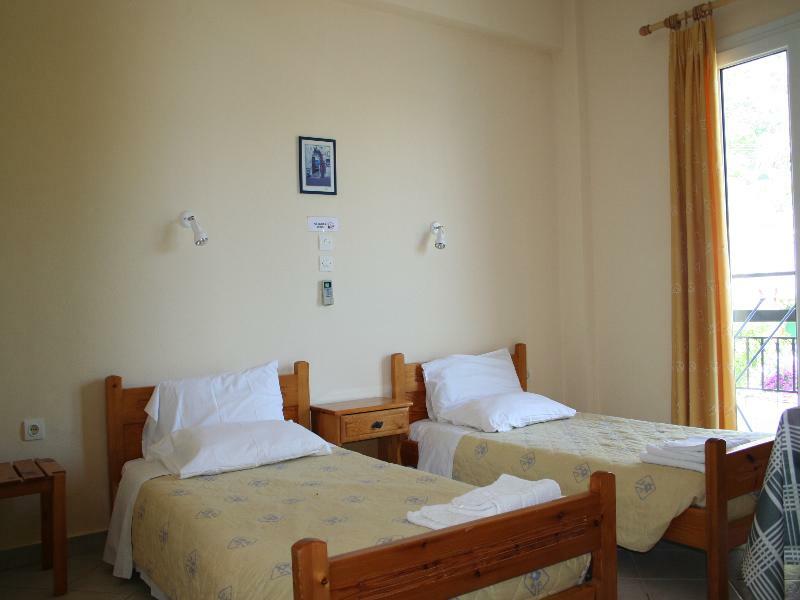 The room has a well equipped kitchen twin beds, Air-Conditioning, free high speed WiFi and use of washing machine. The private veranda is also a great feature of the property. 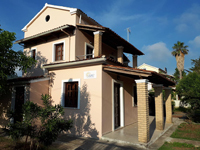 The Avli Studio apartment..
For a relaxing, beach based holiday Kassiopi, Corfu, the Imerolia Studios are in a most enviable position, located right on the tranquil beach of Imerolia, not far from the main resort of Kassiopi. These nice family run studios are basically furnished..
Conveniently situated right in the heart of Kassiopi, the Hotel Oasis offers bed and breakfast accommodation in a very pleasant location.Family run with a very relaxed and friendly atmosphere, all rooms are simply furnished with a private bathroom and..
Katia Beach is a 2* hotel located just outside Kassiopi in the beautiful island of Corfu Greece. The complex is composed of 2 buildings that include studios and apartments. They are set in a beautiful garden, 50m from the beach and 1.2km from the village..